Now celebrating it's 50th anniversary, little explorers can travel the world thanks to Richard Scarry! With 33 stories featuring fun-filled stops in New York, Paris, Tokyo, Egypt, Australia, and more, this worldwide adventure of discovery will have children ready to pack their bags and visit those international Busytowns! Series Overview: In Richard Scarry's busy world, there's always something new to discover. Not only do his books encourage word identification and early preschool concepts, they also open kids' eyes to their community and the wider world just waiting to be explored. 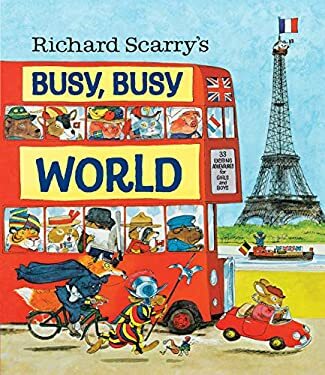 We are re-establishing Random House/Golden Books for Young Readers as THE home of Richard Scarry-both classic and Busytown-with our rebranded and refocused publishing program. This includes a fresh new look and branding, reviving lost treasures from the backlist, and offering a variety of formats and price points. Richard Scarry is and always will be a one-of-a-kind, timeless brand. This book promises unparalleled quality, consistently delivering the biggest, best, and busiest experiences for each new generation of kids. New (19 available) BRAND NEW. Over 1.5 million happy customers. 100% money-back guarantee. Make your purchase count: support Better World Books' worldwide literacy partners.